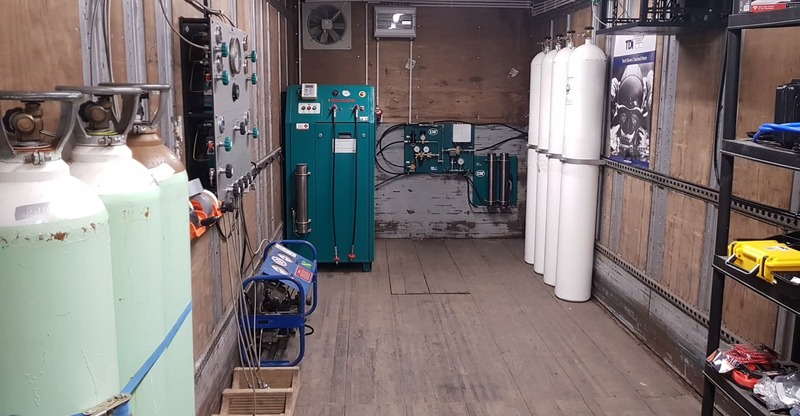 One of the main reasons for starting South West Tech was the lack of availability for high pressure O2 and Trimix here in the South West of Ireland. As a result we set up a facility that could at least give us the gases for the dives that we want to do. We can now supply any and all gases including hypoxic trimix and 100% O2 boosted to 200bar. OUR Air is Triple filtered !!! All fills will require O2 clean and in test cylinders, certification cards for all divers using gases, signing of fill logs and analyzing on site. If for any reason we doubt the cleanliness or certification of your cylinders we will offer to inspect, clean and service the cylinder, but we will not fill it without this check which is for our blender and facilities safety. Nitrox is available from 22% through to 99%. Cylinders have to conform to HSE specifications. Customers will also need to bring their certification for their first nitrox fill. Nitrox can only be issued to those people who have proof of certification and only fills to that level can be taken. Nitrox fills up to 200 bars or 2900 PSi. Nitrox is available from 22% through to 99%. Cylinders have to conform to HSE specifications. Customers will also need to bring their certification for their first nitrox fill. Nitrox can only be issued to those people who have proof of certification and only fills to that level can be taken. Nitrox fills up to 300 bars or 4350 PSi. Oxygen can be supplied up to 200 bar providing the cylinders are in current test and oxygen clean. Either a suitable diving qualification or oxygen administration certificate will be needed to obtain these fills Oxygen currently costs 0.02 cents per litre for top-offs Please remember to bring your certification with you for your first fill. This will allow us to add you to our database for future reference. Gas can only be signed out if an appropriate certification is provided. We reserve the right to charge for any gas which has to be drained due to customers not being able to provide suitable documentation. Failure to pay for gas drained will mean cylinders being retained until the matter is resolved, the gas has been paid for or proof of certification is provided. Cylinders may be sold to recoup costs.